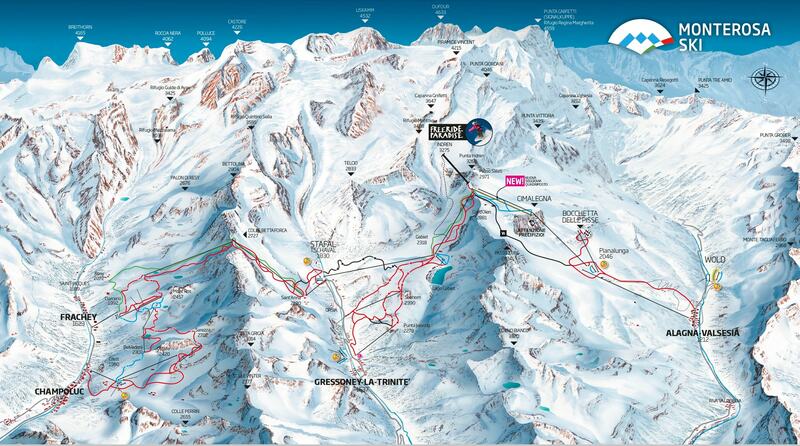 For those looking for amazing Alpine slopes away from the crowds, Gressoney Monterosa resort is the place to go. The area, filled with breathtaking views and peaks reaching well above 4000 meters, offers something for everyone, without forgetting the main reason you’re there - skiing. Here you’ll find essential information for your ski holiday on the Gressoney Monterosa ski resort as well as help and guidance in booking your transfer. Comprised of two villages, Gressoney Saint Jean and Gressoney la Trinité, the resort is located on the beautiful Lys Valley at an altitude between 1390 and 1640 meters. The Gressoney Monterosa resort offers unspoilt Italian village charm, rural architecture, local cuisine and spectacular views combined with modern skiing facilities suitable for every skill level for all the family. The area also offers plenty of off-piste activities such as wellness centers and shopping. Culture enthusiasts can visit the Walser Cultural Center to explore the unique heritage and language of the Walser people. All of the above will only ever result in our base-rate for ski transfers going down – we never over-inflate our prices at any time or for any reason. Substantial discounts for off-peak, off-season and midweek transfers to Gressoney Monterosa are also available. If looking for the best possible deals, travelling outside peak season or midweek typically results in the biggest savings. We offer midweek (Monday to Friday) prices with up to 60% discount than weekend prices. Your transfer fee will also depend on your transfer schedule, vehicle availability, vehicle utilisation and other costs like road tolls and airport parking charges. To enquire about any specific requirements or plans to travel as part of a larger group, please get in touch directly so we can discuss your needs. The Gressoney Monterosa ski area offers a highly varied terrain starting from family friendly ski schools to complex off-piste descents and free-riding opportunities on a glacier at the Monterosa Freeride Paradise. In addition to skiing in Gressoney Saint Jean and Gressoney Gressoney la Trinité, the appropriate ski Lift Pass will allow you to ski or snowboard in the other Monterosa ski resorts of Alagna Valsesia, Antagnod, Brusson, Champoluc and Champorcher. Monterosa is included on The Aosta Valley pass which covers 800 km of skiing terrain served by nearly 200 lifts in over a dozen ski areas. In the Gressoney Monterosa beginners can join one of the ski schools, where they can enjoy their first descents under professional supervision, making their first skiing experiences memorable for all the right reasons. Experienced skiers can catch adrenaline free-riding at the Monterosa Freeride Paradise or on any of the numerous black pistes. You can book a private ski instructor, if the whole family is learning or improving their skills together. Your smaller family members can have a great time in any of the numerous baby snow parks. For those not interested in skiing, the resort offers a family friendly snow bobsleigh slope. Start your ski holidays off with ease with a little help from Alps2Alps. We’re proud to offer the most reliable, affordable and enjoyable Gressoney Monterosa resort transfers, all throughout the season. Take a load off and start enjoying your holiday the moment you step on board. If you’re looking for the best possible deal for your resort transfers to and from Gressoney Monterosa, be sure to book in advance. If you’re unable to find the service or destination you’re looking for on our website, get in touch with the Alps2Alps customer service team today. If you enjoy travelling hustle-free and on time choose Alps2Alps and let us take care of you!